For those of you not familiar with Kimchi, it is very similar to fermented sauerkraut. I combined several different recipes to do a sample batch. I have had a bit of experience making fermented foods, so was eager to try my hand at this Korean favorite. One of the main differences between sauerkraut and kimchi is in the soaking of the Chinese cabbage for a few hours ahead of time in a salt water brine. So, after reading this critical step, I began this batch at 11PM last evening! Finished Kimchi fermenting on counter along with Escabeche (fermented jalapenos and veggies), and sauerkraut. Put the chopped cabbage in the water (I used a large pot) and press down with a heavy plate, etc., to insure the cabbage is under the water. Leave overnight or for several hours. Next day: Remove cabbage from water and place in large bowl. I just scooped it up with my bare hands and squeezed the excess water out. No worries if the salt water clings to it. You will need the moisture as you continue. Mix with your hands till veggies are evenly , um...mixed. 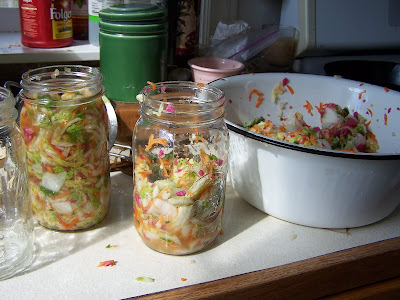 Pack into wide mouth quart jars, pressing down with your fist as you add more veggies. By the time the jar is nearly full there should be PLENTY of liquid from pressing down...enough to cover the veggies. There should be about 1" head space at the top. Cover jar and leave on counter, checking daily to make sure the veggies are covered with liquid. If not, use your clean hand and press down to cover. Taste after a couple of days, and every day thereafter till the Kimchi is to your liking. This could take anywhere from 3-9 days in an averagely warm house. Like around 68-75F. When it tastes good to you, simply make room in your already too-full fridge and store it there. I think I would serve Kimchi with some sushi, maybe some grilled fish. Or even as a side to a burger. 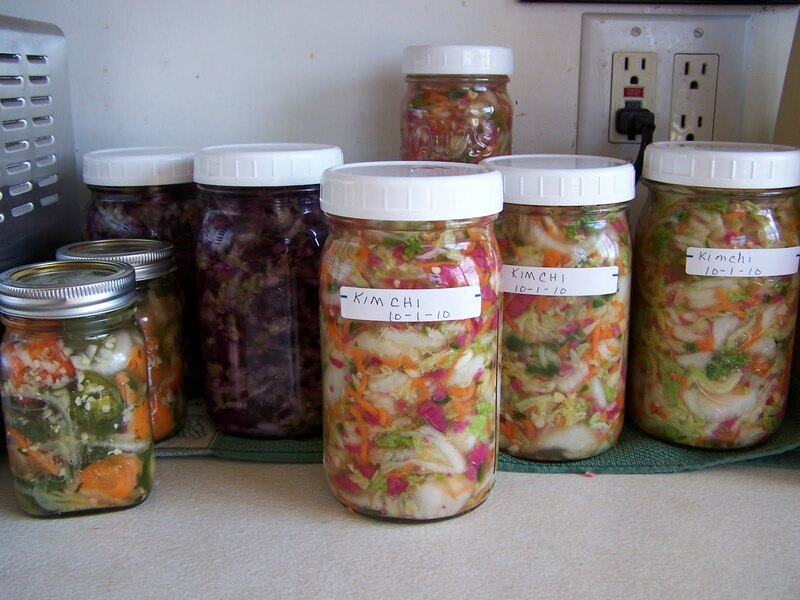 Fermented veggies are good tasting, and good for you! Since I am doing some of this for our CSA demo next week, I made sure this was vegetarian. This is a really simple recipe, especially when all the chopping/grating was done with my Cuisinart! I DID chop the cabbage by hand, but it only took a couple of minutes. I left the cabbage on the coarse side, as that is how I have eaten Kimchi before. But you could certainly chop it as you would sauerkraut. Oh..That sounds really good..Would you use and serve just like sauerkraut..? That looks great! I just found some Chinese cabbage at a local farm, but didn't buy any since I didn't really have any reason to...guess there's another farm trip in my future! My hubby used to work with a Korean guy who used to bring this in for them to eat - he's still talking about how good it is years later! I'll have to print off the recipe & give it a go sometime! I also adored your story about Betty, the deer... How sweet! I love Kimchi. One of my Korean friends served me my first taste and have loved it ever since. I just wanted you to know that I *love* your new header...such gorgeous photos from your life. What blessings!